I think this stationery subscription box is the best kept secret to all... if you've not heard of the #Papergang you need to keep reading. You are missing out. It's not often that I do reviews now... but I couldn't not tell you about this. Brought to you by the people at Ohh Deer, the quirky illustrated gift company, the Papergang is a monthly stationery box filled with amazing Ohh Deer products. If you're a stationery addict, you need to get this box in your life because it is amazing. If you need more convincing, here's what I received in the first month's box. I wasn't sure what to expect in my first Papergang box. The first thing that caught my attention was the amazing packaging. 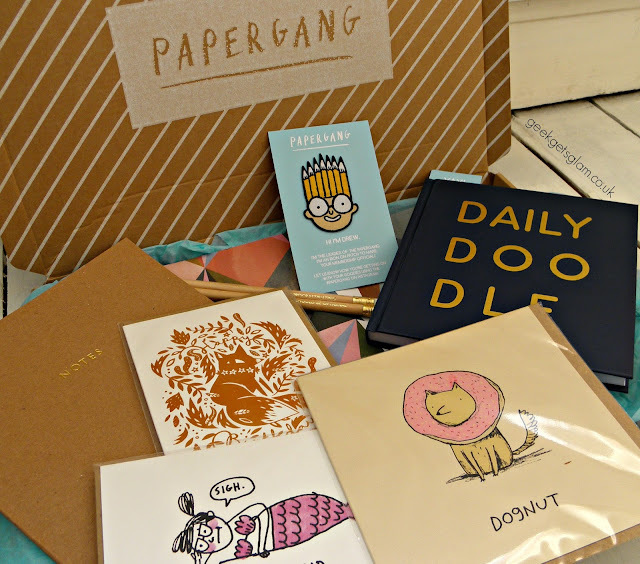 I'm used to subscription boxes arriving in a letterbox sized card box, which this did, but Papergang had a twist! The outer layer was instructions on how to make an origami rhino. Yes. An origami rhino. Pretty much sold at this point as I love origami and if I can make animals out of paper then I am pleased as punch. I noticed that the box was quite bulky for stationery. When I opened the box, I was over the moon to discover that I was one of the lucky 300 people to bag myself an extra freebie! I received the Daily Doodle which is an amazing journal created by Ohh Deer and Urban Outfitters to get the creative side of you flowing. It gives you a random word, and you have to interpret it and draw away! It is such a clever idea, and will be perfect for when I need a break from writing and could do with a doodle. I love the selection of three gretting cards I got in my box. I have actually seen the 'Dognut' one in Paperchase and thought it was such a great design for a card - I can't wait to give it to one of my friends. Also included were a couple of notepads and gift wrap. One pad and the gift wrap featured a colourful geometric print which I really like. I have used the notepad as my blogging brain storm pad - the plain pages make it great to just jot random ideas down as and when. Two cool pencils were in the first box. They are wooden design and one has 'Stop Procrastinating' and the other 'Mondays Should Be Optional'. I believe both these statements relate to my life well so I think I'll be getting my use out of these haha! Overall, I highly recommend the Papergang subscription box. It is packed with high quality items that you will actually use and it's a nice way to sample the amazing products that Ohh Deer sell. I cannot wait for my next Papergang box! Who else will be grabbing one? !